Cameras and their use for aerial photography are the simplest and oldest of sensors used for remote sensing of the Earth's surface. Cameras are framing systems (Figure 5a), which acquire a near-instantaneous "snapshot" of an area of the Earth's surface. Camera systems are passive optical sensors that use a lens (or system of lenses collectively referred to as the optics) to form an image at the focal plane, the "aerial image plane" at which an image is sharply defined. Many electronic (as opposed to photographic) remote sensors acquire data using scanning systems, which employ a sensor with a narrow field of view that sweeps over the terrain to build up and produce a two-dimensional image of the surface. Scanning systems can be used on both aircraft and satellite platforms and have essentially the same operating principles. A scanning system used to collect data over a variety of different wavelength ranges is called a multispectral scanner (MSS), and is the most commonly used scanning system. There are two main modes or methods of scanning employed to acquire multispectral image data - across-track scanning, and along-track scanning. Across-track scanners scan the Earth in a series of lines (Figure 5b). The lines are oriented perpendicular to the direction of motion of the sensor platform (i.e. across the swath). Each line is scanned from one side of the sensor to the other, using a rotating mirror. As the platform moves forward over the Earth, successive scans build up a two-dimensional image of the Earth's surface. So, the Earth is scanned point by point and line after line. These systems are referred to as whiskbroom scanners. The incoming reflected or emitted radiation is separated into several spectral components that are detected independently. A bank of internal detectors, each sensitive to a specific range of wavelengths, detects and measures the energy for each spectral band and then, as an electrical signal, they are converted to digital data and recorded for subsequent computer processing. 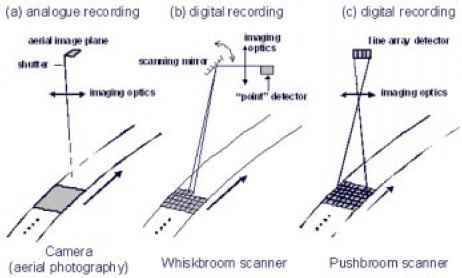 Along-track scanners also use the forward motion of the platform to record successive scan lines and build up a two-dimensional image, perpendicular to the flight direction (Figure 5c). However, instead of a scanning mirror, they use a linear array of detectors (so-called charge-coupled devices, CCDs) located at the focal plane of the image formed by lens systems, which are "pushed" along in the flight track direction (i.e. along track). These systems are also referred to as push broom scanners, as the motion of the detector array is analogous to a broom being pushed along a floor. A separate linear array is required to measure each spectral band or channel. For each scan line, the energy detected by each detector of each linear array is sampled electronically and digitally recorded. Regardless of whether the scanning system used is either of these two types, it has several advantages over photographic systems. The spectral range of photographic systems is restricted to the visible and near-infrared regions while MSS systems can extend this range into the thermal infrared. They are also capable of much higher spectral resolution than photographic systems. Multiband or multispectral photographic systems use separate lens systems to acquire each spectral band. This may cause problems in ensuring that the different bands are comparable both spatially and radiometrically and with registration of the multiple images. MSS systems acquire all spectral bands simultaneously through the same optical system to alleviate these problems. Photographic systems record the energy detected by means of a photochemical process which is difficult to measure and to make consistent. Because MSS data are recorded electronically, it is easier to determine the specific amount of energy measured, and they can record over a greater range of values in a digital format. Photographic systems require a continuous supply of film and processing on the ground after the photos have been taken. The digital recording in MSS systems facilitates transmission of data to receiving stations on the ground and immediate processing of data in a computer environment. What are operational principles of multispectral scanner? 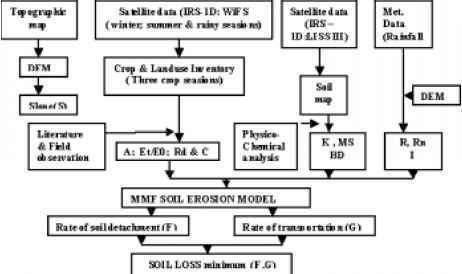 How whiskbroom multispectral scanner operate or scan the earth surface? What is whisk broom scanner? Why cameras used in multispectral scanning?